Barbados Prime Minister slams retiring Chief Justice David Simmons over the ethics of Simmons’ appointment. It was a carefully worded comment delivered with all the outward innocence that an experienced lawyer like Prime Minister David Thompson could muster – but the intent and the impact of the Prime Minister’s words were devastating to the legacy and public memory of retiring Chief Justice Sir David Simmons. Thompson added that he still held the firm belief that Sir David’s original appointment in January 2002 was wrong since it had been made after he was part of the executive or a former Government. “The circumstances of his appointment were wrong, and I don’t think you can cure it because you are a good Chief Justice,” Thompson added. … from the Nation article PM sheds light on CJ issue. Before David Simmons and then-Prime Minister Owen Arthur engineered his “retirement” from government and almost immediate appointment as Chief Justice of Barbados, David Simmons was a professional politician for 25 years. A BLP Member of Parliament in Opposition and Government. A senior Cabinet Minister for three governments. Attorney General. Acting Prime Minister. 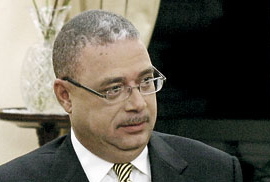 Simmons’ appointment in 2002 was a Barbados Labour Party political strategy designed to exercise political control and influence over the Barbados courts. His appointment effectively killed the separation of powers between the government and the judiciary and brought the administration of justice into disrepute. David Simmons personally caused tens of thousands of Bajans to lose faith in the entire judicial system. Prime Minister Thompson is aware of all that and he knows that his decision to sack Simmons as Chief Justice will go a long way to restoring the faith of the people in the independence of our courts. Those crying that Simmons is hard done by need to get a reality check. Thompson could not possibly have extended the tenure of David Simmons because that would have been giving his stamp of approval to what he knew was an unethical appointment of Simmons in the first place. Who will be our new Chief Justice of Barbados? What a novel idea! Prime Minister David Thompson will put citizens and justice first. Thank you from the bottom of our hearts for your public stance that it was wrong for David Simmons to be appointed as Chief Justice. Thank you for promising that our next Chief Justice will not be a politician or dictated by the lawyer class. Thank you for working to restore the faith of the people in our justice system. For the original Nation article quoting the Prime Minister, you should visit the Nation website: PM sheds light on CJ issue. PRIME MINISTER DAVID THOMPSON last night stoutly defended his position not to extend the tenure of former Chief Justice, Sir David Simmons. The decision, made late last year, had come under severe criticism by a number of members of Barbados’ legal fraternity. But Thompson told reporters at his first Press conference for 2010, that he made the decision based on the amount of time that Sir David had indicated he would be available should the extension be granted, along with other factors. “The law entitles me to make such a determination,” the PM said. He noted that he and the former Chief Justice had discussed the matter more than once, and he (Thompson) then came to a determination. “It is also important to recognise that there are laws for the appointment of a replacement Chief Justice in due course, and I will follow the laws that exist in Barbados,” the Prime Minister added. According to Thompson, himself a lawyer by profession, the only people who have been talking about who should be appointed a Chief Justice, and who is a good Chief Justice are lawyers. “I am not sure that the legal profession is the best place for that argument,” he said in response to a question from Starcom Network’s Ryan Gilkes. Andrew Burgess and Jeff Cumberbatch seem like two good candidates for Chief Justice. Prime Minister Thompson is correct, of course. On the other hand is there not some hypocrisy when one considers that he continues to support Minister Ronald Jones in his position as president of the BFA. Does he not see perceived or potential conflict of interest there? What about Chris Blackman or Sandra Mason for CJ? I am Pat Cheltenham. PM David Thmpson promised me the job. The PM should have kept quiet on this matter. What happens the next time he has problems filling a position and the only candidate available is a former MP. Now THAT, is an interesting comment (also, fairly perceptive) and methinks involves more than just casual comment. I bet Keith Simmons will get the pick. HAHAHAHA this makes me laugh…indeed….just like how who is the government lawyer??? what about Brandford Taitt president of senate…Sandy is ambassador to China….the list goes on..!! LOL HAHAHAHAHHAHA..jokes…. Pingback: » “I am going to hurt you bad …”, US Resident Alleges Threats From Barbados Court Marshals Keltruth Corp.: News Blog of Keltruth Corp. - Miami, Florida, USA. Spot on with this write-up, I absolutely believe this website needs a lot more attention.